Unused lemon juice can be refrigerated for several weeks. Slice the lemons in half, then arrange cut side up on a rimmed baking sheet. Broil at the center of the oven for about 10 minutes, or until the lemons are golden brown. Set aside until cool enough to handle, then juice the lemons into a bowl or 2-cup liquid measuring container. Using a mesh strainer lined with cheesecloth, strain the lemon juice into a blender. Blend for four 25-second bursts. Set aside. Sprinkle a few tablespoons of sugar on a small plate. 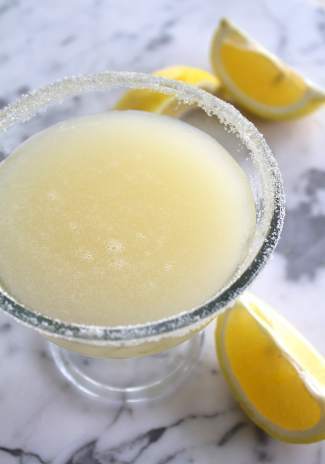 Use one of the squeezed lemon rinds to moisten the rim of a coupette or other suitable glass for a margarita. Overturn the glass into the sugar and gently move around to coat the rim. Refrigerate the glass until ready to fill. To prepare the cocktail, in cocktail shaker filled with ice, combine the tequila, 3/4 ounce of the broiled lemon juice and the triple sec. Shake well, then strain into the prepared glass. Bartender Tony Conigliaro’s new beverage book is called “The Cocktail Lab,” and he’s not speaking figuratively. Among the equipment at his London-based Drink Factory consulting business are a centrifuge (the better to filter macerated liquids), a cold smoker and smoke gun (for smoking garnishes as well as syrup ingredients), and a refractometer to measure exact alcohol levels. Not quite your standard issue bar gear. And an ordinary day in the lab “can involve thermo-mixing, sous-viding, dehydrating — even stripping bark from trees,” Conigliaro writes in the introduction to the book, due out in July. Conigliaro, a renowned British bartender, is a pioneer in so-called molecular mixology, but he’s got a lot of company these days as more bartenders on both sides of the Atlantic work on elevating the art of the cocktail into a science. For Conigliaro, molecular mixology started with people asking questions. “And the more questions people asked you kind of got to points where the only places where you could find the answers were either in the chemistry of food or the science of how it works,” he says. Kevin K. Liu, author of “Craft Cocktails at Home,” sees cocktail chemistry as something that fits into his overarching interest in how science can improve everyday life, something he began exploring while studying technology policy at the Massachusetts Institute of Technology. “I wrote the book about cocktails because I thought this was a field where bartenders and customers alike could benefit from some simple scientific knowledge, but I think the concept applies to many other fields as well,” he says. The best of the new breed of drinks look like regular cocktails but “taste like nothing you’ve tried before,” says Duecy. Bartenders like Dave Arnold at Booker & Dax in New York are developing new techniques like nitro-muddling (flash-freezing fresh herbs with liquid nitrogen, then crushing them into a powder and incorporating it into the cocktail). What you get — intense herb flavor. What you don’t get — herbs stuck in your teeth. And in San Diego, Erick Castro of Polite Provisions, a new bar, works with carbonation so the cocktails are premixed and come out of a kegerator, a refrigerated dispenser, like beer or soda. New tools open up new possibilities. For instance, a rotary evaporator is a piece of lab equipment that lets you “boil” water or alcohol at low temperatures. You can put orange juice in and end up with orange water and orange-flavored jam, “both of which would taste clean and fresh,” says Liu. Alternatively, you could put in bourbon and end with a super high-proof distillate of bourbon and bourbon-flavored powder. Still, while gadgetry can produce new flavors, it takes a skilled bartender to balance those flavors, notes Liu. Conigliaro would agree. He may create his cocktails in a lab-like setting, but he serves them in an atmosphere that’s anything but clinical. The menu at his Bar 69 in Islington, North London, has just 12 cocktails, three wines and Champagnes, and one beer. The gee-whiz techniques are generally out of sight, though customers who want to know what went into a drink are welcome to ask. Want to up your home bartending game? Here are some tips. —Duecy: Make sure you’re using top quality ingredients, i.e., no shriveled limes. Try infusing liquors or wines with fruit, herbs and even vegetables. Start with vodka until you get familiar with the length of time and results you’ll get from certain ingredients. To a vodka-filled jam jar, just drop in some ingredients, and leave the infusion on the counter. Try spices (cardamom, black pepper, horseradish), fruit (pineapple, lemon peel, berries), and vegetables (beets, celery). —Liu: Get some gear. Start with a water filter (Why would you fill up half a cocktail with poor-tasting water?). Then get a dual infrared/probe thermometer. Use it to check temperatures, from how cold your freezer gets to whether you’ve stirred a drink long enough. —Conigliaro: Source your ingredients well. Look at not just what you find on the supermarket shelf, but go that little bit further and find those spirits and cordials. Compare one gin to another. Compare your Beefeater to your Tanqueray and see how the drink works and make choices off the back of that. That’s how you really kind of understand how things work.